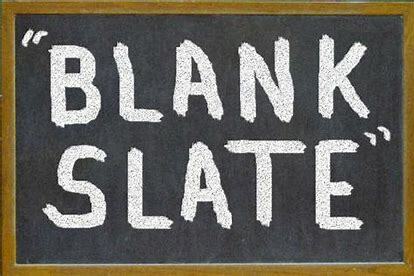 Do you believe in The Blank Slate Theory? The Blank Slate Theory is something that always boggled my mind and intrigued me. Its also always been something that I believed in or at least wished or hoped was true. See, The Blank Slate Theory is a theory which states all human beings are born pure, or a “blank slate” if you will. Over time it is our surroundings and society that shapes us into who we are and who we will be. The slate no longer blank but remembering we weren’t always who we are. Do you believe that people are born 100% pure? Do you believe it’s society that shapes us into who we are? Or do you believe that you are born the way you are and just develop into that person over time? Of course, we ‘evolve all the time but we are also born with certain instincts which are always there with us.